You know how people like to say “Don’t quit your day job”? Well, in my case I really should quit my day job. I work in web development, and while that’s all well and good, this field requires at least some interest in technology. It requires time spent on keeping current with the latest website technologies and trends. Time which I don’t have because it’s spent obsessing about food. Anyways, all that to say I found this incredibly cool tool called wayfaring via Miss Ginsu’s website, The Hedonista. I’m sure it’s been around for ages (months in web years), but since I’ve been heads down in food-related things I’ve never seen it before today. It’s based on Google Maps but you can customize it to create your own little world. My world happens to be all about food stores in Seattle. I just received the latest Splendid Table e-newsletter and read about the new(ish) Eat Well Guide. The Eat Well Guide is a directory of sustainably-raised meat, poultry, dairy and eggs from stores, markets, restaurants, farmers, etc. It appears as though these are the same people who brought us the totally brilliant Meatrix, so that makes me like them even more. I have to take a quick moment to brag about the birthday presents I received this year. There were many beautiful and thoughtful gifts and I love them all. Thank you! My birthday wish came true and I got a thermapen. Yes, A THERMAPEN. After screaming for a few seconds, I ran around taking the temperature of the air, the ground and generally anything that was soft enough to poke a needle into. The thermapen is ridiculously expensive, but the fact that it can take a temperature reading IN 4 SECONDS FLAT is truly amazing. It even came with calibration papers. 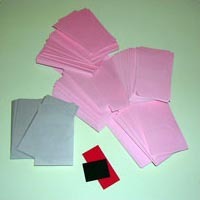 CALIBRATION PAPERS! I love it more than anyone in their right mind should love a thermometer. 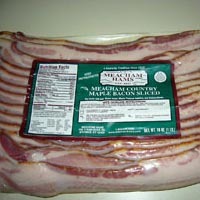 I kind of want to carry it around in my bag and whip it out at restaurants. Okay, not really. 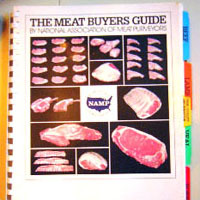 I also received the National Association of Meat Purveyors (NAMP) Meat Buyers Guide. Not only is it oh-so stylish, but it’s useful as well, with wonderful drawings of nearly every type of meat/poultry cut you can imagine. My brother and his girlfriend flew in from NY for my birthday and brought a wonderful and amazing range of foodstuffs from their neighborhood: chili peppers, dried hibiscus, tamarind paste, purple corn pudding, purple drink, huitlacoche (! 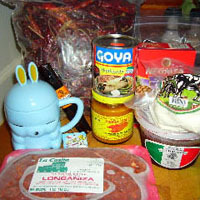 ), Quesos Zurita Oaxacan string cheese, longaniza, mole, yellow hot pepper paste, unknown (and unlabeled) spices, chili candy and more. I’m going to have fun finding recipes for all these ingredients! Lastly, I received some money from my dad and decided to follow my own advice. I bought a beautiful, beautiful, blue doufeu off eBay, which I expect to receive any day now. Oh yeah. I almost totally forgot about this. Luckily I was reading Arthur’s “Cook Next Door” post, which reminded me of how much I’ve always wanted a Hot Diggity Dogger . I’m not gadget happy by any means, but once in a while I’ll find a piece of cooking equipment that I really, really want. Sometimes it’s something completely unnecessary and esoteric, like the Oval Doufeu I came across on eBay—and am still kicking myself for not buying. (If you own one of these, please write and tell me how amazing it is, how I can’t live without it and how it’s worth the $300 price tag.) Sometimes it’s something as simple and indispensable as a $20 soft-sided cooler. My latest lust has been for a thermometer. An $85 Super-Fast Thermapen to be exact. 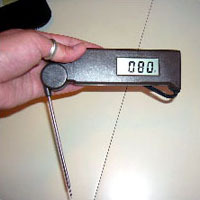 It can read a temperature in less than 4 seconds and makes me dream of perfectly cooked pork roasts and T-bone steaks. I’m throwing a tamale making party in a few weeks, so it was the perfect excuse for an early morning visit to the Pike Place Market for ingredients. I love the market, but I hate crowds, so it’s heaven to be there in the morning when the stalls are just opening and the tourists are still sleeping. I only had a few things to pick up, so I parked down below on Western where they have free parking. My first stop was El Mercado Latino—a tiny store with narrow isles, but the shelves are packed tight. I took a cursory look around, wanting one of everything. I stuck to my list and got Maseca Masa Harina, corn husks, and an assortment of dried chilies: ancho, pasilla and New Mexico. My next stop was La Buona Tavola, Truffle Cafe. They have a beautiful array of truffle products including oils, salts, creams and butters. Plus they sell dried pastas, wines, olive oils and real balsamic vinegars. I was there for the Casina Rossa Truffle & Salt. Zach had bought me a dish for Valentine’s day and I love it. I use it on practically everything, so now my friends are addicted to it. I needed a jar for a birthday present, but I really should have purchased a case; everyone I know wants one. While there, I couldn’t resist getting a truffled porchetta sandwich. I wasn’t hungry, as it was only ten in the morning, but I knew I’d be glad later on (I was and so was my kitty, who ate the napkin that some juices spilled on). Next stop: Don & Joe’s Meats. I heart Don & Joe. But I think I may just have a thing for butchers. 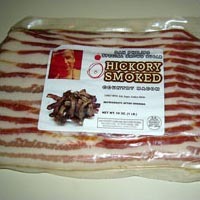 I picked up a beautiful beef shoulder roast and pre-ordered a pack of duck legs and duck fat to pick up the next week. I resisted the urge to go into DeLaurenti, but I just had to stop and buy a huge bundle of gorgeous orange tulips. I happily walked back to my car, thinking that I really should do this more often. I have a new obsession and its name is Wild Boar. Ever since my trip to Vancouver and eating at Wild Rice, I have been dreaming about Wild Boar. I was jokingly telling a friend that we should roast a Wild Boar, but he was so enthusiastic that I decided to look online and see what was available. I found a listing for Exotic Meats and just about died when I realized that they were located in Bellevue, which is a 15 minute drive away. 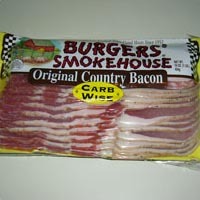 I practically fell out of my chair when I saw that they sell Wild Boar Bacon. By the time Zach and I got home it was past lunch time and we were hungry. We decided the caribou sausages sounded good and I pan fried them in a bit of olive oil. 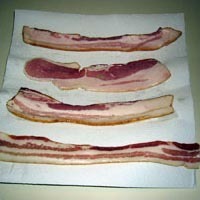 They didn’t appear to have much fat on their own so I was a little worried that they would be dry. I found an assortment of mustards in the fridge: hot English mustard, bourbon molasses mustard from Stonewall Kitchen, Mostarda di Cremona, horseradish mustard and a plain French Dijon. We had also just been to PFI, so to go with our sausages, I opened up a can of giant baked giant beans in light tomato-dill sauce, fried eggplant in rich tomato sauce and sprats. I tossed together a quick spinach salad and we were ready to eat. 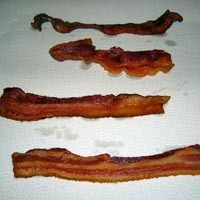 I sliced off a bite of sausage and ate it plain so I could fully taste the flavor. It was incredible. 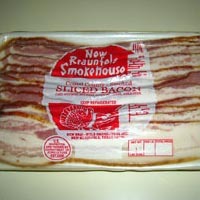 The absolute best sausage I have ever eaten. Despite not being very fatty, the sausage was juicy and very tender, with a texture similar to veal. I can’t really describe the taste because I’ve never tasted anything else like it. I tried some of the condiments and the best ones were the mustards with a touch of sweetness to them; the bourbon molasses mustard and the Mostarda di Cremona. The Mostarda di Cremona tasted like a superb marmalade with a hint of mustard—sweet, tart and hot. As good as the mustards were, I had to eat most of my sausage plain; it was so amazing that I didn’t want to adulterate the taste. Zach and I both agreed that this was one of the best lunches we’ve had in a long time. I received a surprise package from my brother and his girlfriend today. They had recently been to China and sent me something from their trip. The box was small, rectangular, intensely aromatic and smelled suspiciously like pot. I opened it up and it was two bottles of real Szechuan pepper! You know, the kind that has been banned from import into the United States. There was also some shrimp paste and a cookbook called Land of Plenty: A Treasury of Authentic Sichuan Cooking. I don’t think they could have gotten me a better gift. The book looks fabulous with lots of great recipes and information on all the different Szechuan cooking styles—I can’t wait to try out some of the recipes. 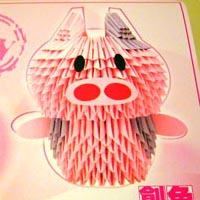 They also sent a cute little origami pig kit. I was really excited to put it together until I opened the package and realized it consisted of about 500 scraps of 1” x 3” paper and no instructions. I called my brother right away to thank him for the wonderful gift. He asked if I’d tasted the peppers yet. He sounded a little dubious, so I asked him if it was okay to eat them raw. He said to try just a little. I was wary, but I took a bite. The taste was like the smell but magnified by a hundred. My brother said to wait a second, so I waited and then my mouth went totally numb. Then the drooling started. My brother was asking me if I was okay but I couldn’t reply because I had my head in the sink, trying to keep the saliva off my shirt. Rinsing helped, but there was a piece stuck in my molar and I swear that it was making my tooth produce drool. I had to brush my teeth and wait about five minutes for all the effects to wear off. My brother was laughing hysterically. For some reason, my parents had a shaker of MSG in the spice drawer when I was growing up. It looked like delicious salt through my eight-year-old eyes, so I shook some straight into my mouth. It was the most disgusting thing I’ve ever tasted. Quite similar to the Szechuan pepper experience in the sense that it enhances the flavor of accompanying foods but is not meant to be eaten straight. But I can’t wait to see how the peppers transform in a recipe. After I got off the phone with my brother I headed over to Zach’s to make him try one. My mom gave me a beautiful new egg cup for Christmas!